This short movie by Griffith has been credited as the “first gangster movie,” and, although other films from the period dealt with crime as a social problem, it certainly has many of the familiar tropes of later movies about criminals. 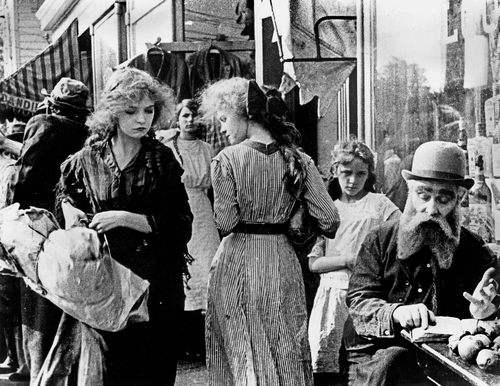 Lillian Gish (from “An Unseen Enemy” and later star of “The Wind”) gets an early starring role as “the little lady,” a married woman living in a tenement over-run with gangsters, including the dapper “Snapper Kid” (played by Elmer Booth, also in “An Unseen Enemy” and “The Painted Lady”) who runs the Musketeers. She resists his advances, and later he robs her husband (Walter Miller, who’s in “The Mothering Heart” and “An Unseen Enemy”). Poor Lillian makes the mistake of attending a “gangster’s ball” with a friend, and another gangster tries to slip her a drugged drink, which Snapper Kid sees and prevents, resulting in a gang rivalry. After a very tightly-staged back alley gun battle, the husband gets his wallet back and Snapper runs to the couple’s flat for refuge from the police, learning of their married status and renouncing his interest in the little lady. The couple pay him back for his decency by giving him an alibi for the police. The complex plot and use of closeups as well as an early follow focus device demonstrate the degree to which Griffith was innovating. A brief shot of Dorothy Gish passing her sister in the street reputedly made a big hit with audiences. Starring: Lillian Gish, Elmer Booth, Walter Miller, Harry Carey, Robert Harron, Lionel Barrymore, Dorothy Gish.